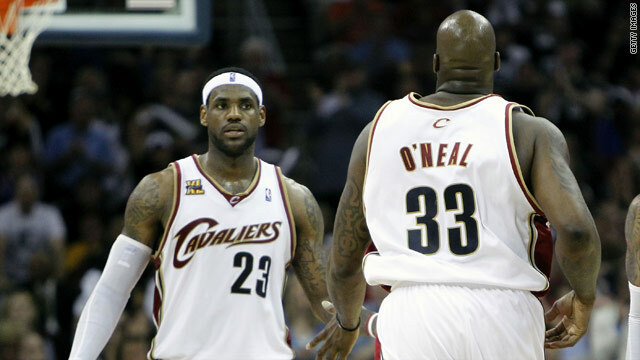 LeBron James and Shaq O'Neal have formed a strong partnership for the Cavs. (CNN) -- LeBron James has been named the NBA's Most Valuable Player for the second year in a row after claiming 116 of a possible 123 first place votes. It gave him a landslide win over the runner-up, Kevin Durant of the Oklahoma City Thunder, who had just four first place votes, with Kobe Bryant of the Los Angeles Lakers in third. The media panel, who decide the prestigious award, had no hesitation in opting for James, whose outstanding play has lifted the Cleveland Cavaliers into the second second round of the playoffs. They beat Boston Celtics in game one of the best-of-seven series with game two on Monday. "To be MVP is definitely an honor. It's a humbling experience," James told the NBA official Web site. "To receive that while you are trying to win a championship, you have to balance it out. I've been able to do that so far." Orlando center Dwight Howard was fourth overall. James, who is determined to finally land the NBA championship with the Cavs after a series of near-misses, has averaged just shy of 30 points per game, with 7.3 rebounds and 8.6 assists this season. It helped Cleveland to a league-best 61 wins in the regular season and left him a near-certainty for the MVP honor. He is only the 10th player to win it twice in consecutive seasons, joining greats such as Michael Jordan, Wilt Chamberlain and Magic Johnson. "I'm just trying to do my job," James said. "Hopefully I can add onto that championship list of names and pass it on to someone when I'm done."